It used to be, not too long ago, that buying an unlocked smartphone online from some unfamiliar Chinese OEM was a sure-fire recipe for frustration. The thing is, the bar for no-contract phones has gotten so high within the past two years or so that you could easily ditch the common flagships down at your local carrier store and live the unlocked life with a great device you've never even heard of. To test that wallet-friendly hypothesis, I took a pair of unlocked Chinese smartphones that either are or soon will be available stateside. 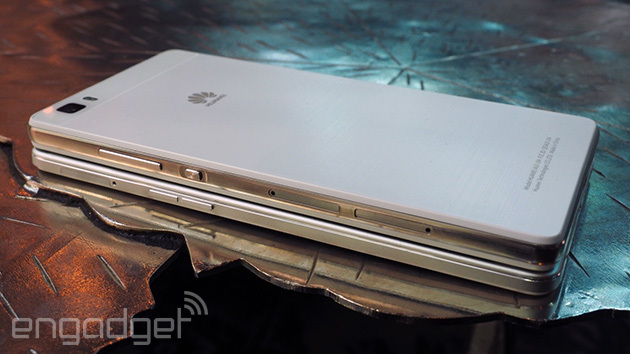 Say hello to the $250 Huawei P8 Lite and the $400 Oppo R7. I'll admit, it might seem a little unfair to compare the P8 Lite to the notably more expensive R7, but the two have more in common than you'd think. Consider the processors thrumming away inside them: They both have octa-core Snapdragon 615 CPUs clocked at 1.5GHz, although the pricier Oppo comes loaded with 3GB of RAM compared to 2GB on the P8 lite. Their AndEBench results bear out those silicon similarities too, as they're basically neck and neck as far as synthetic benchmarks go (though real-world results vary a little) Oh, and both of them obscure Android 4.4.4 -- yes, these are KitKat phones -- almost completely with their own pervasive custom interfaces. That said, the differences here just can't be ignored. First up, the P8 Lite. It's a lower-end version of the flagship P8 (which I'm told won't make it to America any time soon). Indeed, you'd have a tough time telling the two apart at first glance. Huawei's design language is applied almost uniformly to both phones, so that the only visual giveaway here comes in the form of a patterned plastic chassis instead of a slick aluminum one. 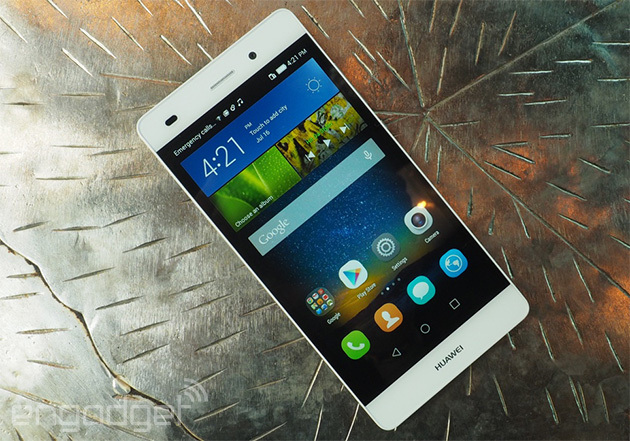 The less-premium construction was one easy way for Huawei to keep costs down. Its choice of screen was another: The P8 Lite has a 5-inch 720p display flanked on all sides by a dark bezel to fool you into thinking it's a bigger edge-to-edge panel. That sort of visual trickery might not be too bad if the actual screen we got was otherwise notable, but really, it's just adequate at best. Colors tended to come off bluer than they should, and everything feels just a little too dim even with brightness cranked all the way up. Oh, and despite having some up-to-date silicon powering things, my week saw a few moments of pronounced flakiness; some letters would pop up twice while I was pecking out texts, and other times the space bar didn't seem willing to follow orders. If there was a saving grace, it was the 13-megapixel camera, which offered up solid, mostly pleasant shots -- provided there were enough photons flying around. Things got noticeably dicier when the sun sank behind buildings in the distance, but hey, that's par for the course with low- and mid-range camera modules. All told, the P8 Lite doesn't aspire to much, and it doesn't achieve much either. The screen is fine; performance doesn't leave me hungry for too much more; and the impact on your wallet will be minimal. It's pretty neat, then, that the Oppo R7 felt like a natural step up -- the sort of device Huawei could've made if it didn't skimp on the parts so much. 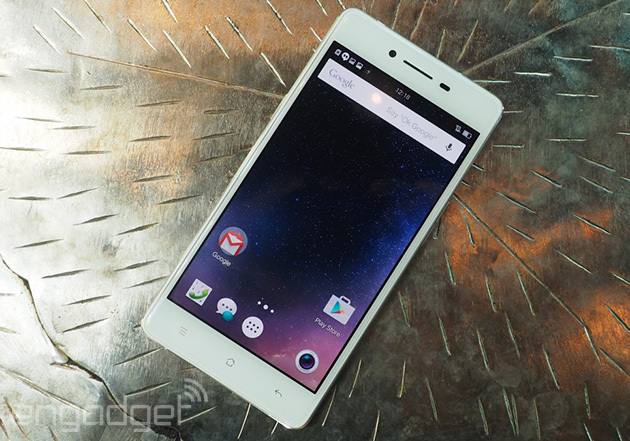 It shouldn't have been a surprise that the $400 Oppo R7 felt like a more premium phone, but it was anyway. Bear in mind: My last real experience with Oppo came in the form of the high-end Find 7 series, which felt light and insubstantial because of their all-plastic bodies. Seriously, I can't get over how good this thing feels. The closest analogue I can think of is HTC's old-school Windows Phone 8X, since both phones have edges that taper off to fit neatly in your palm. That's some high praise from yours truly: The 8X is my all-time hand-feel champion. In fact, I'm starting to think Google would do well to give Oppo some Nexus-making responsibilities. While Huawei's approach to Android was downright inoffensive, it took me a little longer to get used to Oppo's custom ColorOS interface. Still, the whole thing feels decidedly foreign, from the lack of a separate app launcher to the insistence that users be able to apply loads of cutesy themes. My favorite theme so far? Naturally, the one starring a feisty anime pig (it's apparently one of the month's biggest hits). Meanwhile, swiping to the right from the home screen brings up a fixed panel with dedicated music controls. You can swap this screen out with one devoted to photos if that's more your thing, but I find these extraneous bits mostly useless. Good thing you can kill them entirely. Now that I've wrapped my head around it, Oppo's approach feels like the one to beat here. Its Android skin is sleeker, runs better (although that's mostly due to the extra gig of RAM) and still includes plenty of surprisingly smart add-ons. Double-tapping a sleeping screen rouses the phone LG style, for instance, but drawing a circle on it quickly fires up the 13-megapixel camera resting high on the phone's back. Speaking of the camera, most of the photos I took were brighter and more evenly exposed than the ones squeezed out of the P8 Lite, and the more sumptuous 5-inch 1080p AMOLED only helped. Oh, and the pièce de résistance? A built-in GIF mode that does exactly what the name suggests. The R7 also packs an 8-megapixel front-facing shooter (compared to the 5-megapixel module on the P8 Lite), which produced selfies that were more than adequate to appease my awful vanity. Throw in a bigger 2,320mAh battery and a VOOC charger that'll take the R7 from bone-dry to fully charged in about an hour and you've got a phone that pulls ahead of the P8 Lite in almost every way that matters. The only real dealbreaker is the cellular radio in the R7: It doesn't support US LTE bands like Huawei's phone does, so you'll be stuck on those HSPA+ airwaves for the foreseeable future. So, is it worth $150 more than the P8 with its similar processors and lack of US LTE? If you're considering getting into the unlocked-phone game, there's a decent chance it's because of the cost involved and paying upfront for devices like these is still relatively rare in the states. Still, I'd hesitantly pull the trigger on the Oppo over the Huawei if given the choice: It's more attractive; the camera fires off neater photos; and the battery is made to be a better daily companion. I've lived this past week with only limited access to LTE anyway, and to my utter shock, I didn't really miss it all that much. I know, I'm wondering what the hell happened to me too. Edgar Alvarez contributed to this story.